New Practice Members often remark how friendly and welcoming our office is. Here at Optimal Health Family Chiropractic & Wellness Centre Family Chiropractic we realize that convenience and comfort are important factors for patients researching chiropractors in Ottawa, that’s why it is our goal to make your first visit as comfortable and thorough as possible using the latest state-of-the-art technologies. So, make yourself at home and, please reserve one hour for this visit. Upon booking your first visit, you will be asked to not consume any hot beverages or unnecessary medications for several hours before the examination as these can skew the results of our very sensitive testing technologies. When entering our office, you will be greeted by name by either Judy or Josée and asked to fill out a very short form with your basic personal information. We want to see you as quickly as possible and therefore, the detailed history forms will be filled out at the very end of your first visit. You will then immediately be seen by Ottawa chiropractor, Dr. St-Denis, and his Clinical Assistant (Josée) who will inquire as to your presenting complaint, discuss your health goals and give you a brief explanation of our approach and whether or not we can help you. They will then instruct you to put on a gown (women) or shorts (men) and will leave the room for a few short minutes. Once you are ready, they will proceed with a postural exam as well as a chiropractic, orthopedic and neurological workup. X-rays may be taken if necessary. We will then perform an algometry measurement (level of pain or discomfort), a range of motion scan, electromyographic scan, a thermal scan, a heart rate variability scan as well as an electronic foot scan. We will then proceed to a detailed health history. In certain cases, some practice members will be seen by Valerie, our lifestyle educator, for a Bioimpedance Assessment — a technology that measures body composition and cell health among others things. After we study your health history and correlate our examination findings, we’ll make recommendations designed to help you get and keep your health. We call this the Report of Findings. This is usually attended to on your second visit, which may be later the same day or the following day. This two-visit approach reduces the length of your first visit and gives us time to correlate our findings. Upon arriving you will be asked to sign in for your report of findings. Please help yourself to some herbal tea if you wish. You may notice that other practice members may also be present for their reports.In some cases, the doctor will give a brief group report which will outline generalities common to all and what normal findings look like so that you will know what to look for in your confidential personalized individual report of findings which will follow. You will then be guided to the doctor’s office where your findings will be presented and the best recommendations for care will be outlined. We strongly encourage you to ask any questions or voice any concerns you may have. After the investment of time needed on the first and second visits, many patients become concerned that every visit will be of equal length. In a word: no. A typical office visit may require just five to 10 minutes. But don’t think the brevity of a regular visit lessens its value! With the groundwork laid, we can quickly size up the condition of your spine and nervous system, adjust you and get you on your way.Like a regular workout at the gym, each visit builds on the ones before. Miss a visit and we can lose the momentum necessary to make the needed changes. We recognize your time is valuable. We do everything possible to run on time and minimize the impact on your busy life. 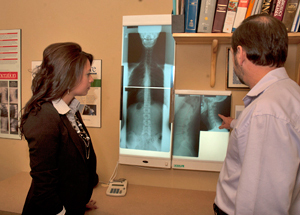 As one of several Ottawa chiropractors, we feel a duty to explain exactly what you can expect in our office. We hope to have answered your questions, but if you still have questions or concerns please give our office a call. We look forward to meeting you!